The Global Hourly Summaries are simple indicators of observational normals which include climatic data summarizations and frequency distributions. These typically are statistical analyses of station data over 5-, 10-, 20-, 30-year or longer time periods. In a GIS map service, the results of these calculations are represented by a given symbology set for different statistical criteria and observation type. Having the ability to modify the symbology "on-the-fly" is a useful tool in the analysis of station trends, accuracy, and regional or localized variances. 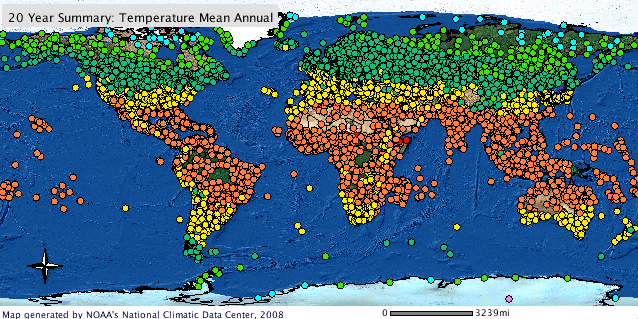 The summaries are computed from the global surface hourly dataset. This dataset totaling over 350 gigabytes is comprised of 40 different types of weather observations with 20,000 stations worldwide. NCDC and the U.S. Navy have developed these value added products in the form of hourly summaries from many of these observations. These data are a subset of the Integrated Surface Hourly dataset (DSI-3505) (C00532). Informational resources and links to the non-subsetted version of the dataset. The Global Climate Summaries are simple indicators of observational averages which include climatic data summarizations and frequency distributions. These typically are statistical analyses of station data over 5-, 10-, 20-, 30-year or longer time periods or for customized periods. Summaries for the following weather elements are available: Ceiling-visibility, dew point statistics, flying conditions, relative humidity, sky cover, sea-level pressure, station pressure, temperature, wind speed / direction, and present weather. Data were derived from stations observing global hourly data. These data may have conditions placed on their international commercial use. For details, please see WMO Resolution 40 or contact NCEI. Purpose The Global Climate Station Summaries are simple indicators of observational averages which include climatic data summarizations and frequency distributions. These typically are statistical analyses of station data over 5-, 10-, 20-, 30-year or longer time periods or for customized periods. Summaries for the following weather elements are available: Ceiling-visibility, dew point statistics, flying conditions, relative humidity, sky cover, sea-level pressure, station pressure, temperature, wind speed / direction, and present weather. Data were derived from stations observing global hourly data. These data may have conditions placed on their international commercial use. For details, please see WMO Resolution 40 or contact NCEI. The following data and products may have conditions placed on their international commercial use. They can be used within the U.S. or for non-commercial international activities without restriction. The non-U.S. data cannot be redistributed for commercial purposes. Re-distribution of these data by others must provide this same notification. A log of IP addresses accessing these data and products will be maintained and may be made available to data providers. For details, please consult WMO Resolution 40, at http://www.wmo.int/pages/about/Resolution40.html. If you have questions about NCEI's implementation of this resolution, please contact NCEI at ncdc.orders@noaa.gov, 828-271-4800. Lineage Statement The Global Hourly Surface Data Summaries are a subset from the Integrated Surface Hourly dataset (DSI-3505) that allow for "on-the-fly" calculations for users.